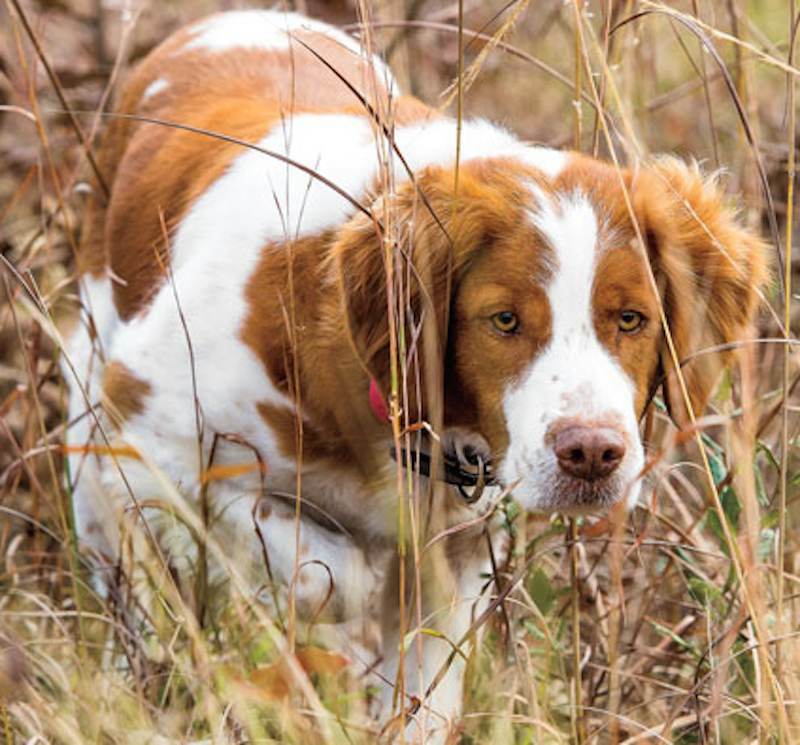 Brittany Spaniel belonged to the small bird dog breeds that crouched under the hunter’s net, which, with time, became the pointers of today. In the French province of Brittany, these bird dogs conformed to the harsh nature of the region and acquired the typical characteristics of the Brittany country (a solid and rustic nature, a matchless and natural stamina, and a stocky and compact constitution). Its colours were white and black, white and brown, sometimes with some orange or even tricolour. They were deadly hunters and were very good at catching feather, and tracking hares and rabbits. In the second half of the last century, crossbreeding with English dogs introduced to the continent by lords who came to hunt partridges and woodcocks, led to the happy results of improving the Brittany Spaniel dog breed’s scent and style. 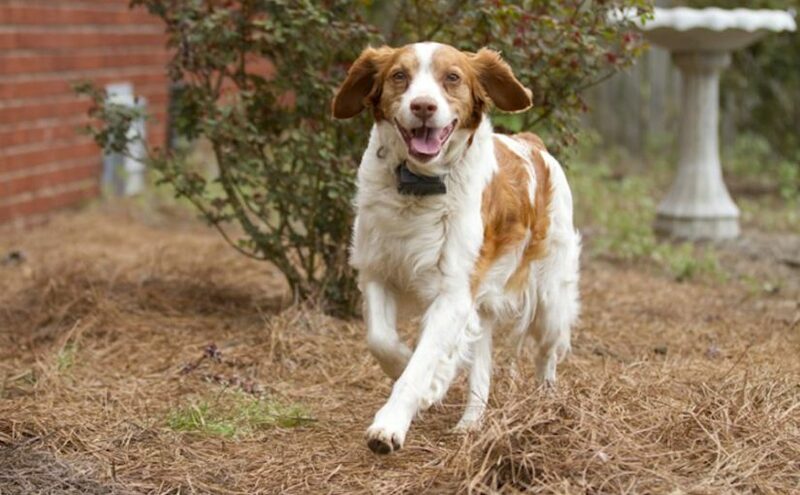 General Appearance: The Brittany Spaniel is a compact, closely knit dog of medium size, a leggy Spaniel having the appearance as well as the agility of a great ground covered. Strong, vigorous, energetic, and quick of movement. Not too light in bone, yet never heavy boned and cumbersome. Ruggedness, without clumsiness, is a characteristic of the Brittany Spaniel breed. So leggy is he that his height at the withers is the same as the length of his body. He has no tail, or at most, one not longer than 4 inches (10 cm). Size: Weight: Should weigh between 30 and 40 lb. (14-19 kg). Height: 17-1/2 to 20-1/2 inches (44-52 cm) measured from the ground to the highest point of the back, the withers. Coat and Colour: Hair dense, flat or wavy, never curly. Not as fine as in other Spaniel breeds, and never silky. Furnishings not profuse. The ears should carry little fringe. Neither the front nor hind legs should carry heavy featherings. Skin fine and fairly loose. (A loose skin rolls with briars and sticks, thus diminishing punctures or tearing. But a skin so loose to form pouches is undesirable). Colour: dark orange and white, or liver and white. Some ticking is desirable, but not so much as to produce belton patterns. Roan patterns or factors of any of these colours are permitted. The orange, and liver are found in standard particolour, or piebald patterns. Washed out or faded colours are not desirable. Faults: Long, curly, or silky hair is a fault. The Brittany Spaniel is a sporting dog breed. Any tendency towards excessive feathering should be severely penalized as undesirable in a sporting dog which must face burrs and heavy cover. Head: Skull: Medium length (approximately 4-1/2 inches (12 cm). Rounded, very slightly wedge-shaped, but evenly made. Width, not quite as wide as the length (about 4-3/8 inches (11 cm) and never so broad as to appear coarse, or so narrow as to appear racy. Well-defined, but gently sloping stop effect. Median line rather indistinct. The occipital crest only apparent to touch. Lateral walls well rounded. The Brittany should never be “apple-headed” and he should never have an indented stop. (All measurements of skull are for a 19-1/2 inches (50 cm) dog. Muzzle: Medium length, about two-thirds the length of the skull, measuring the muzzle from the tip to the stop, and the skull from the occipital crest to the stop between the eyes. Muzzle should taper gradually in both horizontal and vertical dimensions as it approaches the nostrils. Neither a Roman nose nor a concave curve (dish face) is desirable. Never broad, heavy or snipey. Nose: Nostrils well open to permit deep breathing of air and adequate scenting while at top speed. Never shiny. Colour: To tone in with the darkest body colour according to whether the dog is orange and white, or liver and white. Dark nose and pigment are permitted in orange and white dogs. Mouth: Lips tight to the muzzle, with the upper lip overlapping the lower jaw only sufficiently to cover under lip. Lips dry so that feathers do not stick. Well-joined incisors. Posterior edge of upper incisors in contact with anterior edge of lower incisors, thus giving a true scissors bite. Eyes: Well set in head. Well protected from briars by heavy expressive eyebrow. Skull well-chiseled under the eyes, so that the lower lid is not pulled back to form a pocket or haw for catching seeds, dirt, and weed dust. Judges should check by facing head down to see if lid falls away from the eye. Preference should be for darker coloured eyes, though lighter shades of amber should not be penalized. Ears: Set high, above level of the eyes. Short and leafy, rather than pendulous, reaching about half the length of the muzzle. Should lie flat and close to the head, with the tip rounded very slightly. Ears well covered with dense but relatively short hair, and with little fringe. Faults: Tight nostrils should be penalized. A two-tone or butterfly nose should be severely penalized. Drooling to receive a heavy penalty. Flews to be penalized. Overshot or undershot jaw to be penalized heavily. A prominent, full or pop eye should be heavily penalized. It is a serious fault in a hunting dog that must face briars. Light and mean looking eyes to be heavily penalized. Neck: Medium length, not quite permitting the dog to place his nose on the ground without bending his legs. Free from throatiness, though not a serious fault unless accompanied by dewlaps. Strong, without giving the impression of being overmuscled. Well set into sloping shoulders. Never concave or ewe-necked. Forequarters: Shoulder blades should not protrude much. Not too widely set apart with perhaps two thumbs width or less between the blades. At withers, the Brittany is slightly higher than at the rump. Shoulders sloping and muscular. Blade and upper arm should form nearly a 90 degree angle when measured from the posterior point of the blade at the withers to the junction of the blade and upper arm, and thence to the point of the elbow nearest the ribs. Straight shoulders do not permit sufficient reach. Viewed from the front, front legs perpendicular, but not set too wide as in the case of a dog loaded in shoulder. Elbows and feet turning neither in nor out. Viewed from the side, practically perpendicular to the pastern. Pastern slightly bent to give cushion to stride. Not so straight as in terriers. Leg bones clean, graceful, but not too fine. One must look for substance and suppleness. Height to the elbows should be approximately equal distance from elbows to withers. Faults: Falling pasterns are a serious fault. An extremely heavy bone is as much a fault as spindly legs. Hindquarters: Broad, strong, and muscular, with powerful thighs and well-bent stifles, giving a hip set well into the loin and marked angulation necessary for a powerful drive when in motion. Thighs well feathered, but not profusely, halfway to the hock. Stifles well bent. The stifle generally is the term used for knee joint. If the angle made by the upper and lower leg bones is straight, the dog quite generally lacks drive, since his hind legs cannot drive as far forward at each stride as is desirable. However, the stifle should not be bent so as to throw the hock joint far out behind the dog. Since factors not easily seen by the eye may give the dog his proper drive, a Brittany should not be condemned for straight stifle until the judge has checked the in motion from the side. When at trot, the Brittany’s hind foot should step into or beyond the print left by the front foot. The stifle joint should not turn out making a cow-hock. (The cow-hock moves the foot out to the side, thus driving out of line, and losing reach at each stride). Hocks, that is, the back pasterns, should be moderately short, pointing neither in nor out; perpendicular when viewed from the side. They should be firm when shaken by the judge. Feet should be strong, proportionately smaller than other spaniels, with close-fitting, well-arched toes and thick pads. The Brittany is not “up on his toes”. Toes not heavily feathered. An ideal foot is halfway between the hare and cat-foot. Faults: Fat and falling hindquarters are a fault in theBrittany Spaniel breed. Flat feet, splayed feet, paper feet, etc., are to be heavily penalized. Tail Naturally tailless, or not over 4 inches (10 cm) long. Natural or docked, set on high, actually an extension of the spine at about the same level. Disqualifications: Any Brittany Spaniel measuring under 17-1/2 inches (44 cm) or over 20-1/2 inches (52 cm) shall be disqualified from show competition. Any black in the coat or a nose so dark in colour as to appear black shall disqualify. A tail substantially more than 4 inches (10 cm) in length shall disqualify.